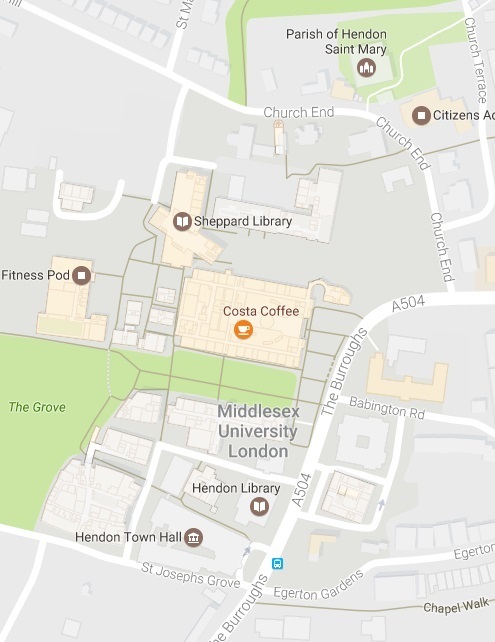 The quarterly meeting will be here at Middlesex, in Hendon on June 1st and 2nd 2017. I made this map by putting our postcode (NW4 4BT) into google maps, and expanding it a bit. The map is expanded to have three or four points of interest. First, in the middle is Middlesex University. The meeting itslef will be held here. Second, in the middle toward the bottom is the Hendon Central tube stop. If you're coming here via tube, that's the way to go. It's a 5 or so minute walk up the campus. The third point is the hotel. That's the little star I put in toward the top and right. It's walkable from the tube, but is quite a few minutes. Fourthly, if you're driving, the M1 is worth noting. Getting here via plane. London has good airports, and you can get here via Heathrow, Gatwick, City, Luton or Stansted. If you fly into City or Heathrow, you can take the tube here. It's a long tube ride from Heathrow, so you might want to grab a cab. Stansted is probably the quickest to campus, but public transport links are weak. Gatwick is surprisingly far away from Hendon. None the less, all work. If you're driving, get on the M1 or North Circular (A406). You can turn onto the A1 from either. You should be able to park at the hotel. If you need parking at the University, send me (Chris) some mail, and I'll sort it. The tube is good, but if you can take the overland train to the Hendon overground station (bottom left centre of the map). It's a bit of a walk, and I don't expect any of you to get here via the overground, but it works pretty well. 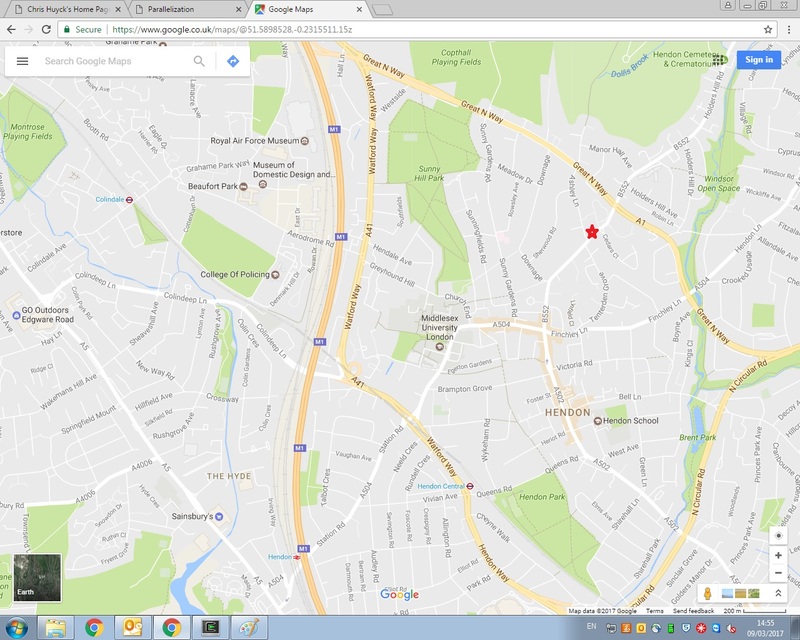 I made this map by putting our postcode (NW4 4BT) into google maps, and zooming in. There are a few buildings here, but the meeting is in the college building. That's the one with the Costa Coffee mark in it. If you walk down the Burroughs, you can walk in the main entrance. Reception is there, and there's a big covered room (the Atrium). (I remember when it was a circular driveway.) The meeting is in the board room (C219), which is up the stairs on the right to the top. If you have any questions, I (Chris) am happy to answer them.